I)	1) Da4, e1=D; 2) fxg, Rg6; 3) Ce7, Rh6; 4) Af4, g5; 5) Dc4, gxf4; 6) Cg8, Rg7/h7; 7) Df7, Rh8; 8) Ce7, Dg3; 9) Df8, Rh7/Dg8; 10) Cf6/Dg8, mate. 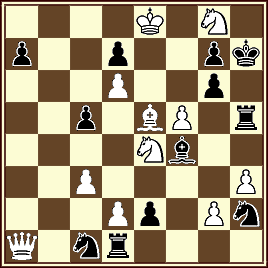 Si 2) …, Rh8; 3) Ce7, Tf6; 4) Dc4, Te6; 5) Df4, Te7; 6) dxe, Rh7; 7) Df8, Rh6; 8) Af6, g5; 9) Dg7, Rh5; 10) Dg5/h7, mate. A) 1) Da4, e1=D; 2) fxg, Rh8; 3) Ag7, Rg7; 4) Dd7, Rh8; 5) g7, Rh7; 6) Cgf6, Rh6; 7) g8=C, Rg6; 8) Df7, Rf5; 9) Ce7, Re5; 10) Dd5, ,mate. B) 1) Da4, Ae5; 2) Dc4, Cg4; 3) hxg, Ad6; 4) Cgf6/Cef6, gxf; 5) Df7, Rh8; 6) Df6/fxg conduce al mate. Igual variación se produce por transposición de jugadas si las negras responden: 1) …, Cg4; 2) hxg4, Ae5; 3) Dc4, Ad6; 4) Cf6, etc.